Some say the era of Drive-In movies has come and gone with the advent of megaplexes and Netflix. But the Kansas City metro is still doing it old school, with three traditional drive-in movie theaters, which play two releases for the price of one and admit kids 11 and under for free, to a raft of informal outdoor summer movie venues that are free (or nearly free) for the entire family. This is budget-friendly family fun that takes you back to a simpler time. When it gets too cold for outdoor screenings, these all close for the season and reopen in May, June or July. Some operate all week, but the majority screen movies only on weekends. The full-fledged drive-ins have concession stands with snacks like popcorn and drinks, including beer. Doors usually open at about 7 p.m. and screenings begin at dusk. During the day, flea markets or other events may take place on the drive-in grounds. The number of drive-ins may have dwindled in Kansas City, but this is not unique. Drive-ins all over are fighting to survive. They experienced a steep drop in the 1980s when multiplexes and home video became the American public's movie weekend of choice. From 4,600 drive-ins at the zenith of the car culture in the 1950s, there are just a little over 300 today in all 50 states. New York and Ohio have the most, with 28 each. Missouri has about 10, according to Drive-Ins.com data. Nationwide, all movie theaters had until 2015 to switch their projection systems to digital, which allows them to run recent releases. Many drive-ins couldn't afford $80,000 to switch from 35 mm to digital projection systems, which was the case for the co-owned I-70 Drive-In and the Twin Drive-In. But Missouri-based B&B Theatres acquired both in 2014 and footed the conversion bill. 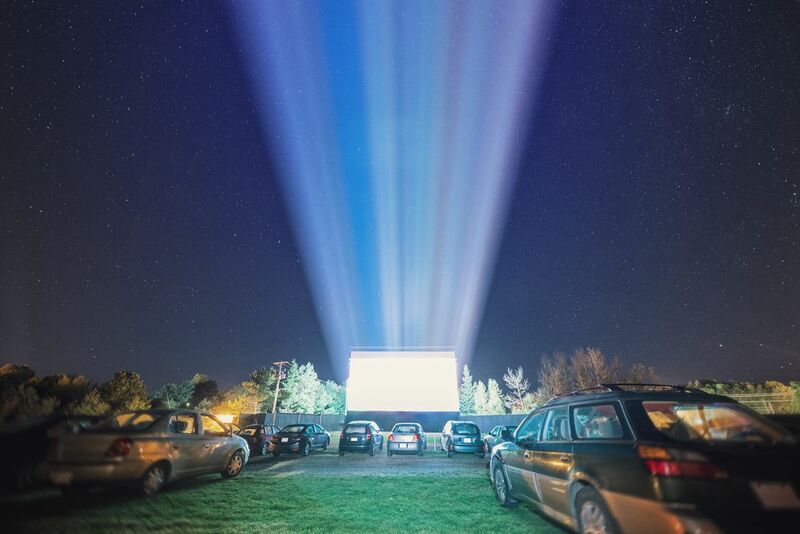 The acquisition made B&B the nation’s third-largest drive-in operator, and the company became one of the country's first drive-in operators to install digital. Boulevard Drive-In, the third drive-in theater in the Kansas City region, entered the modern era by installing what it calls the world's first super clear, 4k digital projector. At more informal venues, from parks and hotel lawns to Crown Center, al fresco summer cinemas have been popping up all over the Kansas City metro. They are typically free and play movies that are classics or simply not recent releases. Nearly all are family friendly and are organized by public entities or nonprofits. It feels a little like a revival of outdoor cinema. If drive-ins can continue changing over to digital and find clever ways to become financially healthy, it could be. Here are Kansas City's remaining drive-in theaters and their less formal outdoor siblings. In each case, visit the website for more detailed information. The 50-year-old Boulevard Drive-In, located near Rosedale Park, may be, as the owner says, "the world's Drive-In," and it's easy to see why: It's the world's first to use a 4k digital projection system, which produces images four times clearer than Blue-ray. It plays a double feature of new releases every Friday, Saturday or Sunday come "rain or shine," beginning in May. Cash only. In addition, a daytime "swap "n" shop" flea market operates here on Saturdays and Sundays. Arguably the largest Drive-In theater in Missouri, the upgraded I-70 Drive-In has four jumbo screens and FM transmitted audio. Located right off of 40 Highway and Stadium Drive, it plays double features of recent releases seven nights a week. An updated concession stand serves a large array of snacks and drinks at reasonable prices. All major credit cards are accepted. The Twin Drive-In, like the I-70 Drive-in, is a modern multi-screen theater that plays double features of mainstream and 3-D movies seven days a week. It features an arcade and an updated concession stand that sells seasoned popcorn at reasonable prices. For R-rated movies, a photo ID is required for customers 17 years of age. All major credit cards are accepted. Celebrate the end of the work week on Friday nights in July and August with a movie on the huge outdoor screen at Crown Center's beautiful Center Square. Anyone who has done this says the quality of the projection and sound are great. Don't forget a blanket to sit on. Guests are not permitted to bring pets or alcoholic beverages, which are available for purchase at the square. Admission is free. The films are part of the WeekEnder Friday night events on the square. Make a family night of it and arrive anytime after 6 p.m. to enjoy top local bands playing. Shop the wares of local jewelry makers and other artisans, and have dinner courtesy of the many food trucks on-site. Then cap off the evening with an iconic movie (not a recent release) that screens at about 9 p.m. The Children's Film Festival at Hyde Park: A youth band concert begins at 7:30 p.m. and movies at 8:30 p.m. on Fridays in June. Accompanied by educational activities for kids. Admission: free. Consult HydeParkKC.org for more information. The Village at Briarcliff Movie Nights: Briarcliff Trails presents family movies at Mulberry Lake across from The Village at Briarcliff. Movies begin at 8:45 p.m Saturdays, June through September. Bring blankets, lawn chairs and, if you wish, a picnic dinner. Admission: free. Visit BriarcliffTrails.com for more information. Theatre in the Park: The Movies in the Park series includes fairly recent releases that are all PG or PG-13; they sometimes include jolly sing-a-long versions of animated hits like "Frozen." All films are shown at 8:45 p.m., June through August. Admission: $1. Visit TheatreinthePark.org for more information. Kansas City Public Library Off-the-Wall Film Series: Great PG and PG-13 films are shown every second Friday, from May through September. Every year there is a theme, such as Sorta Shakespeare: offbeat films inspired by the bard; and Misfits, Music, and Mayhem: quirky characters fighting the status quo. Shown at 8:45 p.m. on the rooftop terrace of the Central Library with the Kansas City, Missouri, skyline as a backdrop. Bring blankets and folding chairs, but no glass containers. Friends of the Library provide popcorn. Locally brewed beer is also available. Admission: free. For more information, visit KClibrary.org.